Open attached composition, and run it. Spread out the four console windows so you can see all of them at once. In the console window that has the text, "Type here:", begin typing. Enter characters, words and/or lines. Notice output in other three console windows. Not what you'd expect! The characters, words and lines are occasionally what one would expect, but more often not. They all display numbers (that don't seem to correspond with ASCII or unicode numbers), or blank lines. The number 7 seems to be quite common. Sometimes whole words appear in the characters console, and lines can also appear in the words console. 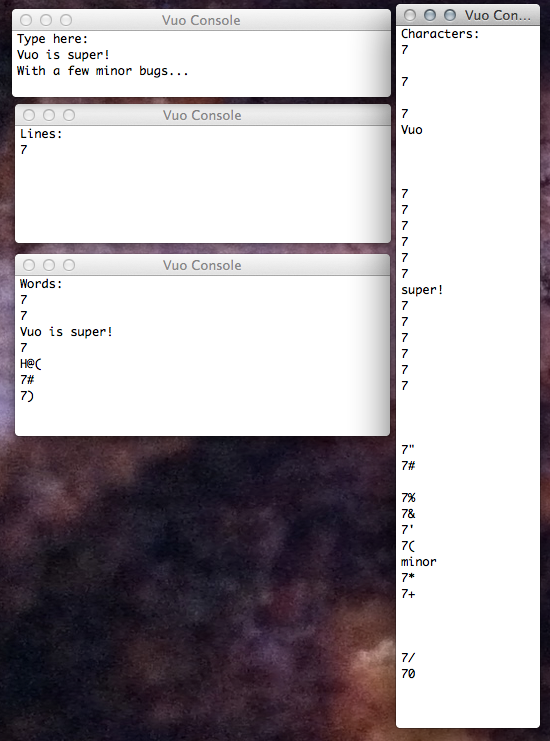 The behaviour occurs whether the composition is run from the Vuo Editor, or from an exported app. The included image was captured before hitting return on the second line, "With a few minor bugs...". The composition crashes at different moments every time its run, but at no point was I able to successfully hit return after that second line. When using the example, CalculateTip.vuo. The first number (42) yielded incorrect results (15% shouldn't be 11.55). And entering more numbers after that gave wrong results as well. Most often a 15% tip of 1.05, which happens to correspond with a bill value of 7, apparently a common number regardless of which composition is being run. Thanks for reporting this, Philip. We just noticed that a couple days ago, too. We're working on it.